How to turn sound into images? That’s a question that a lot of people ask me when they see my collection of images transsubstantiatio. The answer is really simple: data bending. This is an easy tutorial to turn sound/audio into images/photos. Data bending is any kind of process that involves turning one type of media into another. In this case, sound/audio into images/photos. 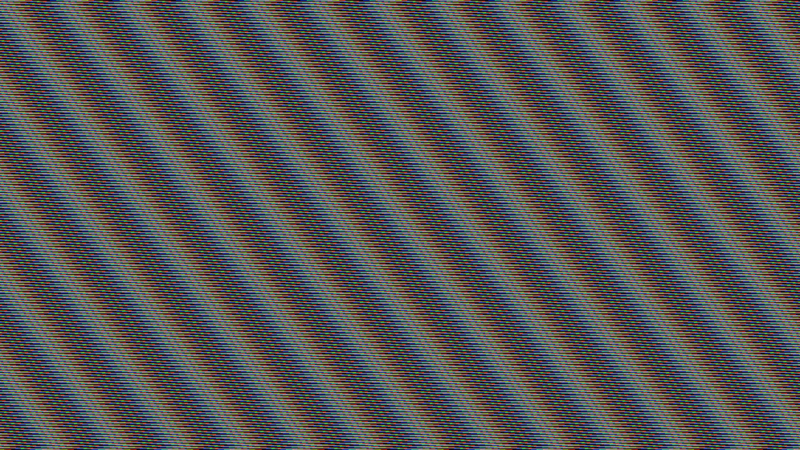 Data bending techniques generate glitches, so data bending is part of glitch art. But what I’m going to explain is also an audio visualisation technique, so it’s between glitch and data visualisation. First, you need an audio software that saves RAW files. You can use a lot of different softwares, for this tutorial I’ll use Audacity, which is cross-platform and open source, so you can download it for free. 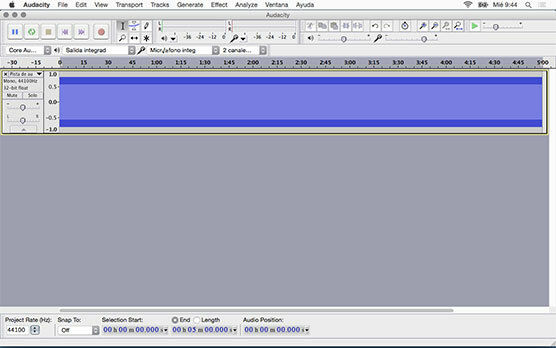 Open Audacity and then open or create an audio file: music, noise, a pure tone, whatever… It doesn’t matter. I’ve generated a 440Hz sinewave (Generate > Tone > Waveform: Sine), but it works with any audio file, so choose whatever you want. You have to export this sound as RAW: File > Export audio > Format: Other uncompressed files. Options… Header: RAW (header-less). In Encoding, I choose U-Law or A-Law because I think that the images generated using those encodings are more aesthetically appealing, but maybe you prefer another option. You’ll have to take your time to do some tests because the results are always unpredictable. Now you have a .raw file. For the next part I use Photoshop, any version. I have tried to use other image editors, some of them work, but not all. Some image editors don’t recognise RAW files saved using Audacity. 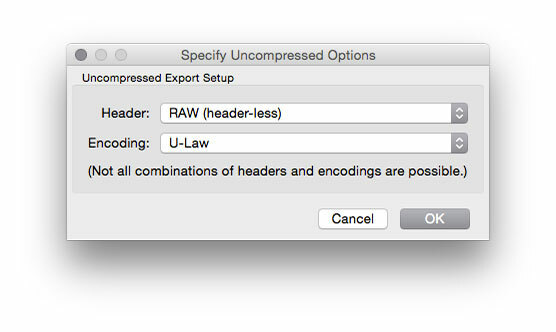 Open your RAW file in Photoshop. You’ll see this window. 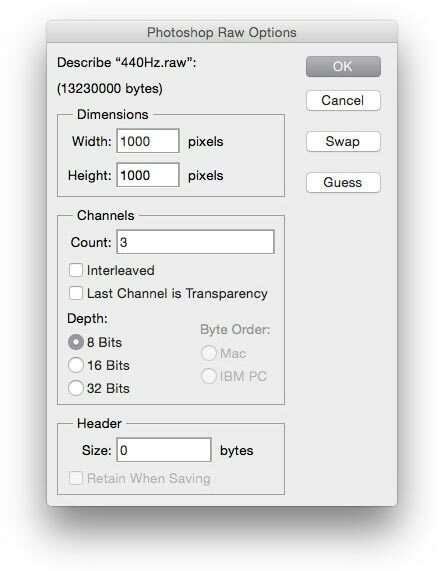 Choose the dimensions, the only limitation is the size of the RAW file. 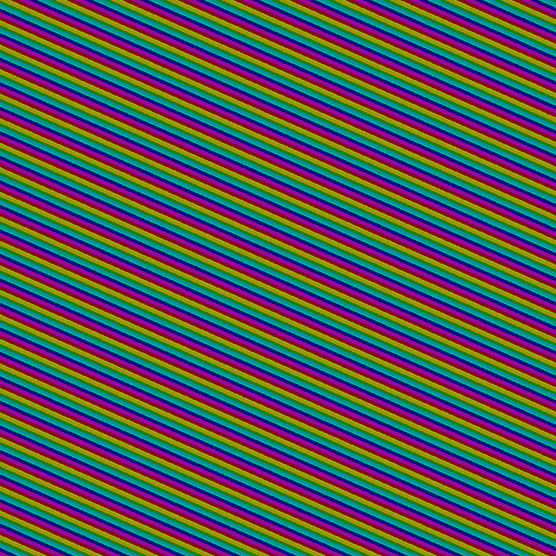 If you choose very large numbers, you’ll see this message: Specified image is larger than file. If that’s the case, reduce Width and Height. Channels Count is the colour information: 1 for black & white images, 3 for colour images. You can check Interleaved or not, usually I prefer to uncheck it because I like it better (just for aesthetic reasons). Click OK and that’s it! This is my 440Hz sinewave. I choose Width: 1000, Height: 1000, Channels Count: 3, and unchecked Interleaved. If you use other dimensions, even with exactly the same audio file, you’ll get another pattern. If you use music instead of pure tones, the result will be completely different. Sometimes just noise, sometimes much more interesting. As you can’t predict the outcome, you’ll get a lot of uninteresting images. But, if you keep trying, you’ll get also wonderful visuals from time to time!